Barabbas (Italian: Barabba) is a 2012 American-Italian television movie directed by Roger Young. ↑ Allison Keene (2013-03-25). 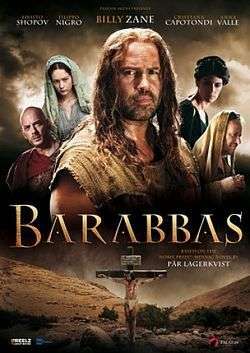 "Barabbas: TV Review". The Hollywood Reporter. Retrieved 22 March 2014. ↑ Bill Gibron (October 30, 2013). "Review - Barabbas (Blu-ray)". DVD Verdict. Retrieved 22 March 2014.